Bottling beginning of March, the wine expresses the freshness, the crisp and the delicacy of youth. Between Wintzenheim and Turckheim these flat alluvian deposits of the Fecht are rich in clay (22%). The soil is predominantly of sand, shingle, and silt with a high incidence of pebbles and frequent plates of loess. From this vineyard come wines which are soft and sensual. The grapes were hand picked and whole-bunch pressed very slowly and gently in pneumatic presses over 5-8 hours to give a clean must and a beneficial amount of skin contact. Transferred to thermo-regulated stainless steel tanks the juice then began a natural fermentation using only its own natural yeast which lasted for one month. The fermentation was initially temperature controlled but was eventually allowed to proceed at its own pace to allow the wine to develop its own character and complexity. The wine stabilized in stainless steel tanks naturally during the winter season and, following a very gentle filtering, was bottled in March 2007 before the heat of summer to preserve the natural carbonic gas (a natural anti-oxidant). 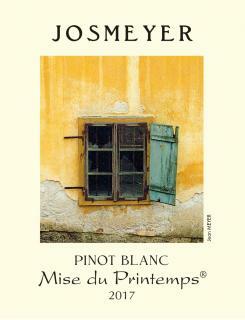 Malolactic fermentation is always avoided at Josmeyer and no chaptalization takes place. Ideal served fish terrines, mussels, cockles, omelettes, soufflés, raw vegetables and creamy cheeses.